I know, 24 hours simply isn’t enough time to explore New Zealand’s capital city, but that’s what we had at the tail end of our trip. Still, we managed to have a wonderful time in Welly after our morning ferry boat ride from Pictonto Wellington. 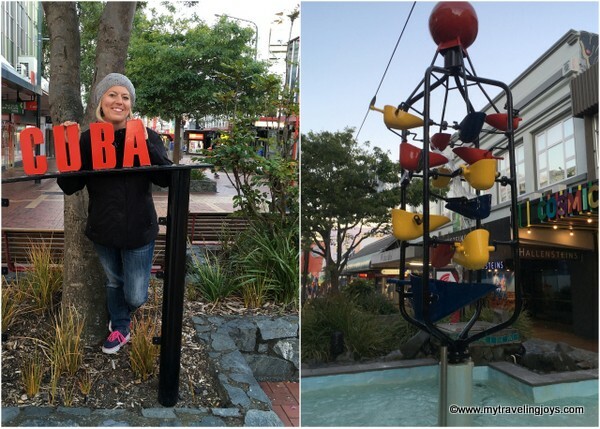 Here’s a recap of our brief stay in Wellington, which may help you if you also plan a trip to this part of New Zealand. After taking a ferry boat across the Cook Straight, we immediately settled in for lunch at Shed5. 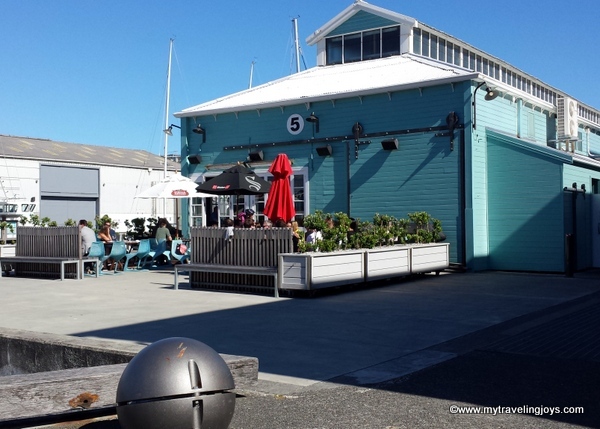 This former woolshed that faces the harbor was recommended by fellow foodie and blogger friend, Meg of Notorious MEG, who lived in Welly for several months. Along with a bottle of Marlborough Sauv-Blanc, we ordered six oysters and three seafood appetizers to share. 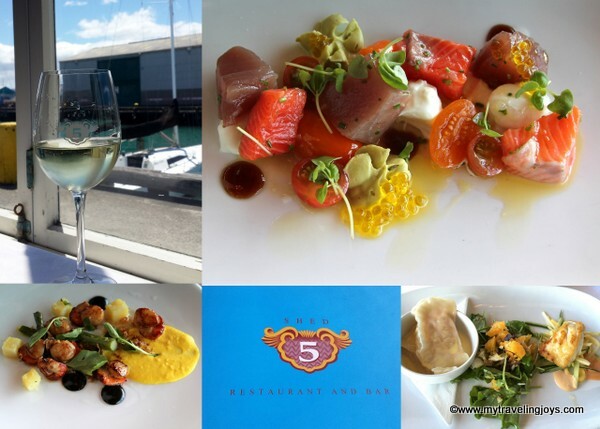 My favorite was a ceviche salad of flash cured tuna and Akaroa salmon with cherry tomatoes, mozzarella, avocado mousse and olive oil caviar. Another recommended restaurant is Prefab Café, which features a seasonal menu and locally-roasted coffee. After dropping off our luggage, we headed out to explore the city. 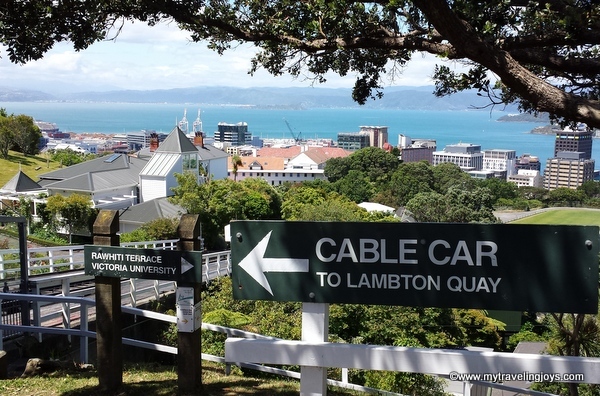 We took the historic, red cable car to the top of hill where the Wellington Botanic Gardens is located. The lush gardens cover 25-hectacres of protected land with native forest, rose gardens and giant pine trees. We admired the city views over the harbor and meandered through the gardens. To get a good taste of Welly, I think it’s best to spend some time strolling along the waterfront to Oriental Bay. 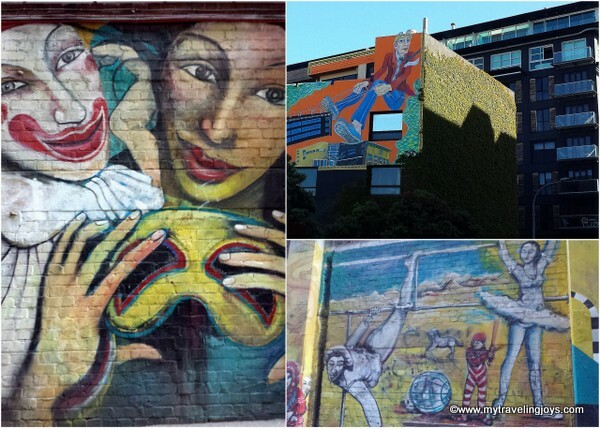 The seaside is a beautifully walkable space dotted with cafés, parks, sculptures, bars and even food trucks. After work, we met one of my husband’s colleagues and his wife for a drink near the crowded Queens Wharf. With so many places to choose from in the CBD, it’s difficult to decide where to eat. Luckily we simply had to follow our Kiwi friends to Hummingbird Eatery & Bar, a local pub with good food. 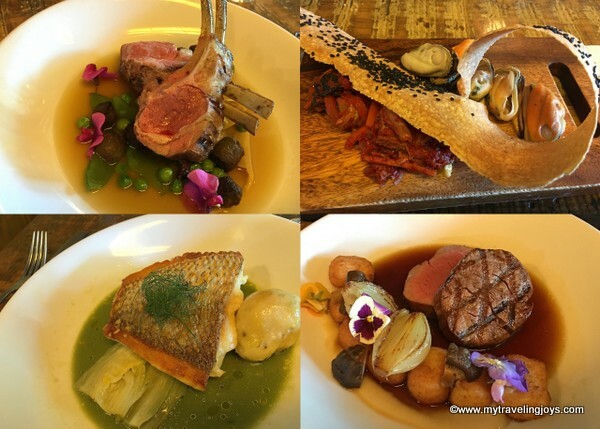 We covered the NZ basics and ordered mussels, lamb, a steak and locally-caught snapper. We also found some local street art in the area. 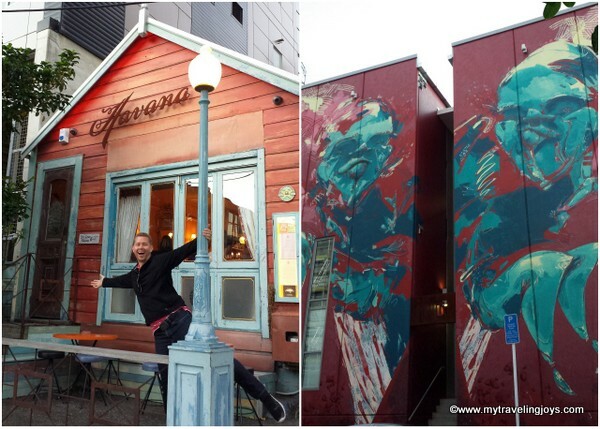 Oddly, Wellington has a connection to Cuba with a bustling, pedestrian-only street aptly called Cuba Street. Though the street is named after an 1840s ship, many establishments have taken up the Caribbean theme. Fidel Café is a popular place for breakfast and coffee. We opted for an after-dinner drink at Havana Bar, a local speakeasy-style bar hidden inside two historic cottages. You’re pretty much required to have a rum-based cocktail here or perhaps a Cuban cigar. After enjoying a hearty breakfast at the boutique Bolton Hotel where we stayed, we set out to do some last-minute Christmas shopping. Neither of us really enjoys shopping, but we needed to find a few gifts. Fortunately, we were within walking distance to the “Golden Mile” formed by Lambton Quay, Willis Street, Manners Street and Courtenay Place. 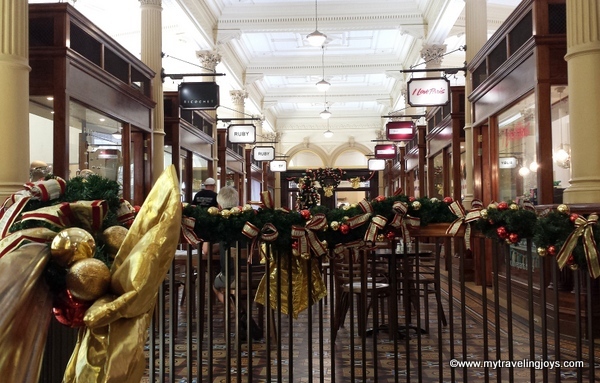 We discovered some charming, local shops at the Old Bank Arcade (also known as the Bank of New Zealand building). The designated-historical building, completed in 1901, was built on the site of the Plimmer’s Ark, an 1840s wooden ship that later was converted into a prominent wharf. 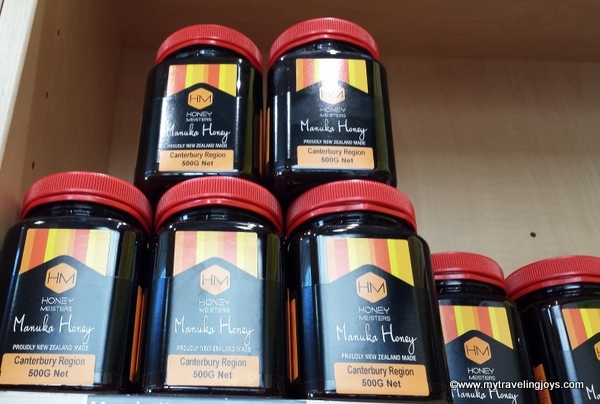 If you love honey, don't miss out on trying the local Manuka honey. Delicious! Walking in sunshine along the boardwalk, we headed to the Museum Of New Zealand Te PapaTongarewa to learn a bit about the local Maori culture. The free museum, except for special exhibits, features an impressive collection of Maori artifacts and cultural treasures. I was particularly impressed with the wood-carved Te Hono ki Hawaiki (meeting house), which depicts the links to Hawaiki, the spiritual homeland from which the first arrivals to NZ came. The meeting house is gorgeous! We spent a little over an hour at the museum, but easily could have stayed longer. If we had more time, I had wanted to see the current Gallipoli: The Scale of Our War, an exhibit telling the story of WWI through eight New Zealanders. Also, don’t miss the nearby Maori Arts Gallery which sells beautifully-carved, local green gemstones in the form of necklaces and earrings. Although we missed out hiking to the top of Mount Victoria Lookout, I think we did a fairly decent job of covering Welly in 24 hours. This post is linked up with #WeekendWanderlust by travel bloggers A Southern Gypsy, A Brit and a Southerner, Justin Plus Lauren. 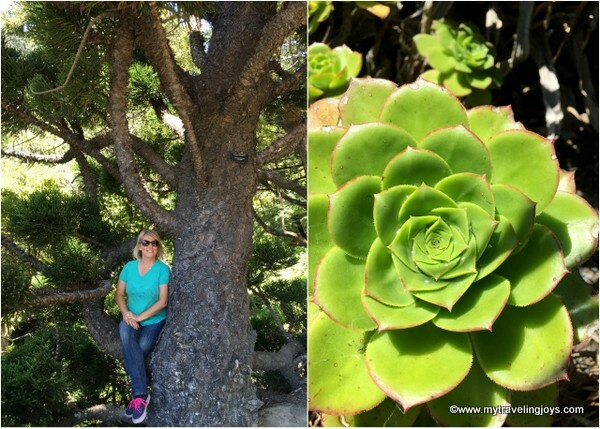 Hop on over to see more travel stories! 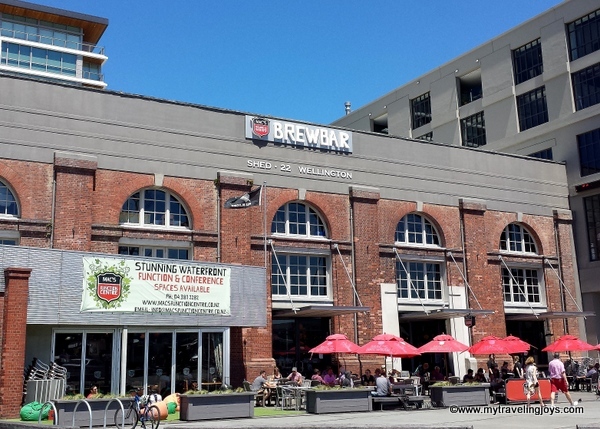 We are currently planning a trip to New Zealand and we will certainly consider a stop in Wellington! The ceviche salad looks delicious! 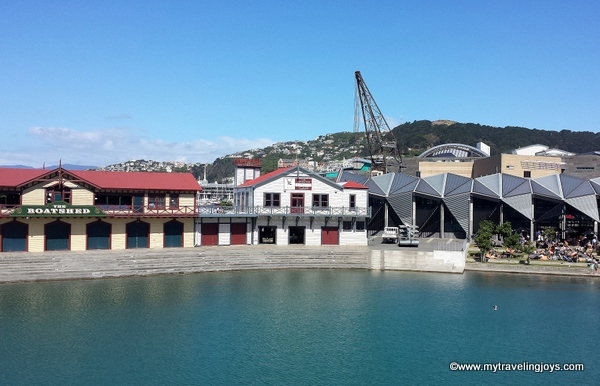 Also the waterfront definitely looks like a spot we'd want to visit as well! Thanks for the great recap! I love your food choices- simple and elegant! It sounds like a wonderful day. @Eat work Travel, well worth your time for a day or two. We only wished we had had more time to explore the North Island. Have a wonderful trip!